The best adventures are shared with friends and family. A solid four person tent will sleep you and a few family members or buddies side by side, giving you a place to play games and recount the day’s antics, whether it’s s’mores and grilled fish, or putting miles under you feet. Four person tents come in a wide variety of shapes, sizes, and weights. We’ve broken down the best 4 person tents into camping, backpacking, and ultralight backpacking categories to help you hone in on the tent that is right for you. Weight: 18 lbs 8 oz. The REI Kingdom 4 is a true palace. It has a six-foot peak that only slopes down slightly, two doors, and a massive vestibule for protecting gear, cooking, or even hanging out. Partial sides of the tent are solid fabric, which provide privacy and make the tent more durable, and a large square of mesh on the top of the tent allows for stargazing, especially with the roll-back fly. The tent is a little complicated to setup — there’s one hubbed pole set and two large door poles — but once you get the hang of it you are living in style. The tent fits four people with ease, and has tons of pockets for storage. If price is not a concern, and you want to unpack an 18-pound palace, the REI Kingdom 4 is the choice. This tent won our Premium Pick Award for 2017 – and was updated in 2019. The new version is a bit easier to set up, sturdier in wind, and has more mesh. Read our full REI Kingdom 4 review. See the REI Kingdom 4. Weight: 8 lbs 14 oz. The Big Agnes Big House 4 is a good-sized, very capable camping tent. With 56 square feet of interior space you can technically fit four adults in here (as long as they don’t mind being cozy), and people can stand almost all the way up with a five-foot peak height. The Big House 4 sets up simply, has an exterior rain fly that covers the mesh top, and provides decent protection and privacy along the side walls. The rain fly doesn’t extend to the bottom, so there are no vestibules for your gear, unless you purchase the vestibule extension, which gives you a huge amount of covered space outside the front door. The doors are huge and there are two of them. Plenty of pockets and a solid warranty round out the Big House 4, and it remains fairly lightweight if for some reason you’d need to hike it somewhere (though we don’t recommend backpacking with it). If you want a do-it-all four person camping tent look here. See the Big Agnes Big House 4. Weight: 8 lbs 13 oz. 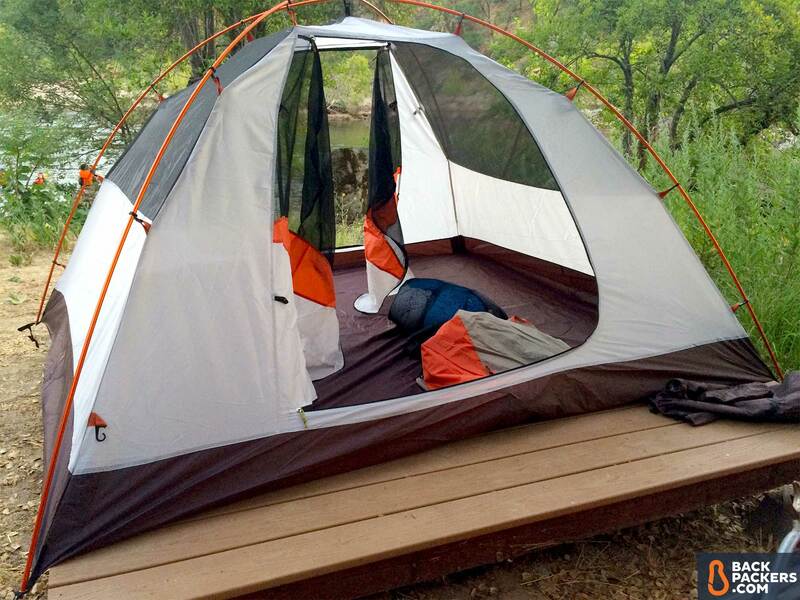 The REI Camp Dome 4 camping tent is classic, basic, and won’t break the bank. It has a solid amount of room and can more comfortably fit four adults than other tents on this list. The peak height is a little low, so be prepared to kneel when packing. Setup is very simple, and the fly gives you weather protection over the mesh top and has a small peak on either side. There are two large zippered doors, aluminum poles, and windows. The Camp Dome 4 also remains fairly lightweight if for some reason you’d need to hike it somewhere (though we don’t recommend backpacking with it). If you need a basic but functional tent, look here. See the REI Camp Dome 4. Weight: 19 lbs 9 oz. The NEMO Wagontop 4 person tent is a slightly over-the-top, incredibly comfortable camping tent. At nearly 20 pounds, you will not want to haul this far from the car, but all that weight adds up to some sweet digs. The Wagontop 4P has a flat 6-foot height, meaning that almost anyone can stand fully in the tent. That’s huge. And it’s literally huge, because it has nearly 70 square feet of space, letting you actually sleep four adults without issue. Specs aside, the Wagontop is unique. It utilizes a single wall design, so setup is simple and most of the tent is not mesh, unlike many other tents on this list. It also has a huge single door and vestibule out the front, allowing for storage of gear, a cook setup, or just a general hangout area when the zippers are down. The Wagontop is expensive for a reason — if you want a luxurious pad while camping carside, check it out. Weight: 8 lbs 10 oz. The Alps Mountaineering Lynx 4 tent is a hybrid backpacking and camping tent, but we prefer it for camping. It is quite large, and will technically sleep four people, but three will be quite comfortable and have space. Due to the backpacking design, the Lynx 4 has a low ceiling height, meaning you can only kneel and sit up — no standing allowed. The tent has covered side panels and a mesh top, which is great for stargazing with the rainfly off. The rainfly provides full protection and ample space in the vestibules for gear, but the setup is finicky and keeping it taut can be tough. We suggest the Lynx 4 for those that want a solid tent that can fit a lot and has protection built in, while also being backpack-able in a pinch. The Alps Mountaineering Lynx 4 won our Classic Pick award for 2017. Read the full Alps Mountaineering Lynx 4 review. See the Alps Mountaineering Lynx 4. Weight: 18 lbs 10 oz. The Eureka Copper Canyon 4 tent is well known by campers, and has been used for years. It’s a true cabin-style tent with a whopping seven-foot peak height, allowing everyone to stand up fully. The large single-zippered door allows easy entry, and the rainfly only covers the top of the tent, protecting the mesh ceiling. The Copper Canyon is relatively cheap, mostly because it uses a fiberglass pole, and has a more economic oriented design. It will sleep four no problem, and weighs 18 pounds, so you won’t want to haul it far. If true cabin-style camping is ideal, look here. See the Eureka Copper Canyon 4. The Coleman Sundome 4 is the tent to buy if you’re on a budget. It’s often on sale, stands up decently to weather, and can technically fit four people, while three people can be be quite comfortable. The bottom of the Sundome 4 is made of tarp-like material, so the tent doesn’t usually need a footprint, and the rainfly provides protection over a mesh ceiling and the single door. It’s not extremely heavy, has a lot of space and is the cheapest quality tent you can find. See the Coleman Sundome 4. Weight: 5 lbs 10 oz. The Big Agnes Copper Spur UL4 HV is one of the lightest four-person tents on the market, and is a larger version of the incredibly popular Copper Spur UL2 and UL3. It is most comfortable with three people, but has more space than some other backpacking tents on this list, and can fit four if necessary. Special features include extra large mesh storage pockets, two large and fully functional vestibules, the ability to pitch the tent with just the footprint and rain fly, and incredibly light DAC Featherlite poles. It’s a low backpacking tent, so we don’t think it works well for car camping, but if you can stomach the large price, it’s hard to do better for 3-season backpacking. 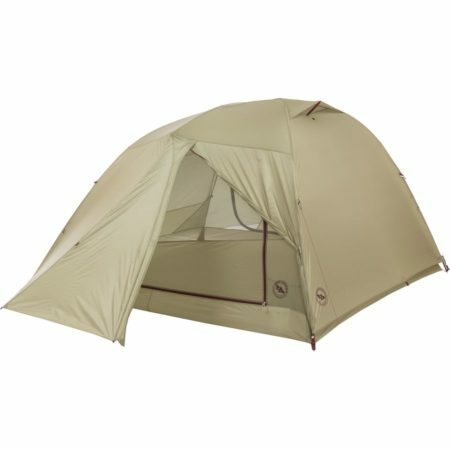 See the Big Agnes Copper Spur UL4 HV. The REI Half Dome 4 Plus is the largest version of the uber popular Half Dome 2 Plus, a tent many people use for both camping and backpacking. Despite having a much larger living space than most tents on this list, the Half Dome 4 Plus is not the heaviest. It has a relatively low peak height, so you can only sit up, but the tent’s architecture allows everyone to sit up, rather than just those in the center. There should be just enough room for four actual adults as well (depending on the adult), and plenty of room for three. The Half Dome 4 has a unique hubbed pole system for easy setup, and the rainfly can be pitched outward to create more room. There are tons of interior pockets, and the tent can be split up by multiple people for easy carrying. Overall a fantastic large backpacking tent that would work well for car camping too! See the REI Half Dome 4 Plus. Weight: 6 lbs 8 oz. The MSR Papa Hubba NX is the largest of the Hubba line of tents, known for their minimal weight, excellent durability, and innovative design. The tent is a high-end backpacking tent, and will barely fit four people (in true backpacking tent-style). It’s really better for three, or a small family. The fly can be rolled back for stargazer mode on warm and clear nights, and you can set up the tent in Fast and Light mode (no mesh) for a bit of shade. It’s a fantastic tent, but the specs are not quite as big or light as the Big Agnes Copper Spur UL4 HV. It also received MSR’s pole and slight design update in 2019, and is sturdier than ever. See the MSR Papa Hubba NX. The Hilleberg Kaitum 4 is a tunnel tent, and designed differently than most of the tents on this list. Hilleberg is known for making extremely durable tents, which often means heavier products, burlier fabrics, and more weather-resistant designs. The Kaitum 4 is a long tunnel with two deep vestibules. The tent does not have a rainfly, just two mesh doors at either end, and vents for airflow. The tent is relatively low, but it has nearly vertical sidewalls on the interior, meaning everyone can sit up easily. It will be a serious squeeze for four, but you will be protected. The tent needs to be staked out well, and can withstand most 4-season environments. Due to cost, this tent only makes sense for adventurers who want a nearly unbreakable tent in adverse weather. But if that’s you, it’s hard to go wrong. Also, consider the Kaitum GT, which offers a giant front vestibule and a bit more interior room. See the Hilleberg Kaitum 4. Weight: 7 lbs 7 oz. The Kelty Grand Mesa 4 is a classic, if basic tent. It utilizes standard tent construction with a full rain fly and separate mesh body, allowing easy setup and stargazing potential in warm climates. The materials are thick and will withstand weather and dirt. In true backpacking tent fashion, the interior space is large enough for three, but will be a tight fit for four. It has a single door, which is less than ideal for groups of four, but for the price it’s an easy decision. If you split up the weight over four people, or even three, carrying will be a breeze. It carries Kelty’s solid warranty, and will provide shelter in three-season environments. See the Kelty Grand Mesa 4. Weight: 8 lbs 11 oz. The Marmot Tungsten 4P tent works for backpacking or camping, and while it could theoretically fit four people, three is much more realistic. It’s built for backpacking, so while the peak height is a little low, the pre-bent poles have maximized interior space so everyone can sit up, or be on their knees, with ease. The Tungsten comes with a footprint, which is a large added value, and it has a solid rainfly for inclement weather. The tent is mostly mesh without the fly, which means stargazing. There are two D-shaped doors, and one larger “front” vestibule and one smaller “back” vestibule. Perfect for a family that wants to backpack and car camp with a single tent. It also looks cool, has a lamp shade pocket that diffuses a headlamp’s light, and sets up easily. See the Marmot Tungsten 4P. The North Face Talus 4 is a good hybrid tent between backpacking and camping. It has the standard features you’d expect from a solid brand, and it comes with a footprint and extra-large gear loft, which are usually available for extra money. This makes the tent a great value. That said, the Talus 4 is not really large enough for four people, so plan for three unless you want to literally be touching everyone. It is relatively lightweight for the cost and size, but is shallower than some tents as well. Because of this backpacking makes more sense, as most people will want to stand up (or nearly stand up) while camping. For the price and the extras the Talus is a good choice for those that want a reliable, basic 4 person backpacking tent, but we’d likely choose one of the other tents above before settling on this one. See The North Face Talus 4. The Hyperlight Mountain Gear UltaMid 4 is arguably the peak of pyramid tents. It is by far the largest four person backpacking tent on this list, with over 80 square feet of sleep-able space, assuring that four adults can comfortably fit. It is made of Dyneema Composite Fabric (DFC), a newer material that is naturally waterproof, has a crazy high tear strength, doesn’t stretch, and is super light. This tent weighs less than everything on this list, and is much bigger. The tent has meshed venting at the top, a single zippered door, and needs to be staked out with a pole (or tree hanging) for setup. It also doesn’t come with a pole, so you need to have a trekking pole (or a separate tent pole) that’s long enough to get it to the peak height. There is no floor, and no mesh interior, though you can purchase both of those things separately. If you want a deluxe yet minimal tent, the UltaMid 4 may be for you. The big drawback is price — the UltaMid 4 is double the cost of the semi-comparable Black Diamond Mega Light, and if you want the extras, can run you nearly $1000. If cost is no object, weight is critical, and you want a truly ultralight setup, you can’t go wrong. See the Hyperlight Mountain Gear UltaMid 4. The Tarptent Hogback is a unique family-style backpacking tent that prioritizes weight over everything. Tarptent is a cottage gear company that specializes in unique tents with lots of custom options. The standard Hogback comes with a full mesh interior and separate large rainfly, which provides full coverage. You can also purchase a partial solid interior, which provides more protection and privacy. The Hogback is not freestanding, and has to be set up through tensioned stakes. There are two very small vestibules that serve only to protect your pack in rain. The interior space can technically fit four small people, but three is more realistic. You will need to either purchase seam sealing, or seam seal it yourself, and will want to set it up in the backyard before taking on the trail. Overall the Hogback is a dream if weight and ultralight backpacking is your goal, but you want everyone to stay in one tent. Best for families, or couples with dogs. Weight: 2 lbs 13 oz. The Black Diamond Mega Light is a pyramid tent, which is really just a shelter that provides the absolute basics for protection. It is made of a single rainfly and one center pole. There is one zippered opening, it has to be staked out, and it has decent interior room with a high middle peak. There is a separate, optional bug net if you want mesh, and there is no floor. Ultralight backpackers revel at the minimal weight and space for thru-hikes, and alpine mountaineers bring it as an emergency shelter (it’s that light). You can use a trekking pole instead of the included carbon center pole, again reducing the overall weight of your pack. The material is thin but strong, and setup is key to a wind-, snow-, and rain-free night’s sleep. Not the tent for everyone, but the Mega Light can sleep four in a pinch and three comfortably, and it weighs less than most two person tents. See the Black Diamond Mega Light. Four person tents can usually fit four adults in a pinch, are quite comfortable for three, and can be the ideal option for a couple with children or dogs. They function best when used with people you’re close with, as you’ll be sleeping in relatively close quarters, despite the potentially tall ceilings. We’ve broken down the best 4 person tents into three overarching categories that deal with camping and backpacking, and are sorted to help you get the right tent for your adventure, whether it’s setting up right next to your car or backpacking many miles to your campsite. A couple 4 person camping tents in a relaxed campground. Four person camping tents are the big boys on our list. They’re the heaviest by a mile, so don’t plan on taking them far from the campground. They’re also the most spacious and feature-laden tents on this list. There are a few crossover tents, namely the REI Camp Dome, REI Half Dome 4 Plus, and ALPS Mountaineering Lynx 4, but for the most part these tents are large and in charge. The REI Kingdom 4 is a true 4-person car camping tent, and makes the top of our list for sheer comfort. Four person backpacking tents are the ideal choice for an overnight group hike or a week-long wilderness excursion that has many people who all want to sleep in the same tent. They can be a bit tight for four full-sized adults, but they’ll work. The equipment is fairly light and can technically be rolled up tight for a single person to carry, but we recommend splitting the parts among the group. Four person ultralight backpacking tents are all about providing a quality shelter at the lightest possible weight. These tents provide single-wall protection and don’t often come with floors or mesh unless you pay extra. Their minimal designs still provide plenty of protection from the elements — at least for the outdoor enthusiasts who live by the “less weight, more fun” mantra. Perhaps the most important yet most overlooked aspect a tent-buyer should consider is the tent’s livable space, that being its interior size and overall vibe. You’ll likely be spending some serious time in your tent, so you should make sure that you actually enjoy being inside its walls. The first consideration is livable space. Will a tent really fit four people? Or is it 3+, and just how spacious is the headroom? The Alps Mountaineering Lynx 4 can technically fit four, but with the low ceiling we prefer two or three people. Consider how many people you’re looking to share the space with and what you will use it for. Are you going to crawl inside right at sunset and fall asleep? Or will you be chatting and playing games with your hiking buddies for a few hours? More space and extra features add weight, but they’ll make sharing camp with friends more comfortable. Floor area should be your first consideration in livable space. If the floor is small, four people will feel cramped, not to mention all your gear. If the floor is large, you’ll have room to stretch out. While size of the floor does matter, it’s not the only factor here. Sure, more square footage does mean more space, but the shape is just as important. Look to see how long and wide the tent’s floor is. A square floor like the REI Half Dome 4 Plus will provide the best shape for sleeping four people side-by-side. If you’re on the taller side you may want to sacrifice width for length with a tent like the more rectangular Kelty Grand Mesa 4. Some of our recommended ultralight tents — like the Hyperlite Mountain Gear UltaMid 4 — have a massive floor area. This is because they don’t actually have a floor — that is, material on the ground. These are pyramid style tents, which offer much great floor area, allowing you the space of a traditional box-style floor and the staked out space (typically found in a rainfly). Pro Tip: Know how big your friends are and if they’ll all fit inside your tent before you head out, otherwise you may be drawing straws for who sleeps out with the camp critters. Peak height is simply how tall the roof of the tent is. A few camping tents have flat (or almost flat ceilings), so the peak height isn’t a single point, but most tents arch highest in the center and slope downward. As with the floor, shape matters here too. Do you want a tent that everyone can stand or sit in? Check the peak height, which will be at the tent’s center, then look at the curve of the ceiling and walls. A tent you can stand up in is a tent you can find comfort in. When car camping, tall tents are luxury. A Backpackers.com enthusiast in the REI Kingdom 4. The walls will drop differently depending on the style of the tent. More rigid structures will maintain a high ceiling throughout, using more poles to do so, while lightweight tents are rounded or pyramid shaped. Pro Tip: Make sure the tent is fully staked out to achieve maximum peak height and floor area. This is hard to pinpoint as it’s highly subjective. Basically– does the tent feel cool? Simply looking at a tent can be enough to answer this for some people. Others, however, need to explore the details. There are many factors at play here, but we can help you figure them out. Research how many interior pockets a tent has and if there are other storage methods like a gear loft or loops. Are the vestibules large enough for your backpacks? Storage is quite important, especially when several people are sharing the space. Pockets, gear lofts, color, and tent fabric all factor into vibe. Does the tent feel like home away from home? What features are included and are they important to you? Some tents offer unique extras, such as the Marmot Tungsten‘s lamp shade pocket and the MSR Papa Hubba’s rollback stargazer fly. These simple differences are what make each tent unique, allowing you to choose what is right for you. And don’t forget that many tents come in a variety of colors — a great option for those of you who want to express yourselves. How much does the thing weigh? This information may be vital if you’re a long-distance backpacker, but not so much if you prefer to car camp. The serious car camping tents even come with a backpack-esque carrying case. These are truly not meant for backpacking trips, and you won’t want to walk more than a few hundred feet with them. Others are much smaller, and can be divvied up between people. Consider how heavy a tent is and who will be carrying it. If you’re breaking down the components and sharing them among your fellow hikers the weight and size will not be so burdensome, but you still likely won’t want it to top 10 pounds total. On the other hand, if you’ve organized a family camping trip and no one wants to share the load, you may be stuck hauling the whole tent on your own. This is where you’ll really want to know how big the tent is when it’s all packed up. Can it fit inside your pack or will you need to strap it on somewhere? Modern tents require little setup these days. That said — some are easier and quicker than others. You won’t want to get caught out on a ridge struggling to pitch your tent as rain begins to fall and darkness looms overhead. Pay attention to the tent’s rainfly — its ability to not get wet on the inside during setup. Most backpacking tents have this fairly well covered, but some car camping tents struggle. They are more “fair weather” tents — get one that fits the most likely conditions you’ll be in. Don’t underestimate a good rainfly. Many car camping tents, even for four people, don’t really cover all the bases when it comes to rain and wind protection. A good example here, with the REI Kingdom 4 fully covered against rain, and the smaller, less protected tent next to it. Also pay attention to how easily and quickly you can set up something in the dark, and in the rain. The larger car camping tents, like the REI Kingdom 4 and NEMO Wagontop, do require more time, even if they have hubbed pole designs. Pro Tip: Set up your tent in your backyard (or living room or a local park) before heading out. This will give you familiarity with any confusing steps, and make sure if you’re in a jam you can set it up quickly. All of the tents on our list, aside from the ultralight backpacker tents, are freestanding. This means that when fully assembled the tent will stand on its own, a quality which allows you to setup camp just about anywhere. The ultralight tents require you to stake them out in order for them to stand. This reduces the need for extra poles, but it makes it difficult to pitch on places where obstacles such as solid rock or tree roots cover the ground. It also generally increases the time it takes to set up — until you’re a staking pro. If you’re looking for a four person tent you’ve already decided that you’ll be camping with other people. In general, make sure you’re getting a tent that is large enough to fit your crew. Not all four person tents can comfortably fit four adults. Look into all aspects of the livable space before deciding on what to purchase. This is your home away from home, after all. Next, know your intended use. You don’t need an ultralight shelter if you’re driving your family campervan to a state campground, and you don’t want to carry an 18 pound palace on your back for 20 miles. Be sensible and decide what is right for you. Tents have a lot of details that are easily seen and explained online. If you can see a tent fully erected in person, that’s fantastic, but even the largest brick-and-mortar retail stores won’t have more than a few for you to see at a time. There just isn’t enough room. Online retailers are quite good at giving you a solid look at tents through numerous pictures, detailed descriptions, and customer reviews. Cottage company products like the Hyperlite Mountain Gear UltaMid 4 can’t even be found in stores– you have to buy it online. It’s perfectly normal to do the research and buy a tent online without ever seeing it in person. A great tent will either be used until it’s coming apart at the seams or it will be sold after only a couple of outings. You can score a lightly used tent at a low price if you keep your eyes peeled, but it will surely be snatched up quick. See our REI Garage Sale article for nabbing a lightly used tent (and other gear). A new tent can last you for many years if kept properly, and it’ll come with a warranty to boot (something that may not crossover with a used tent if there is no proof of purchase). Year-to-year companies tend to release new editions of their tents, though the changes are often minimal until a big update rolls around every handful of years. What we’ve seen is common throughout all contemporary outdoor gear: a push toward lightweight materials, smaller carry size, and refined design. You’ll see that most tents on our list are shaped like a box, a dome, or a pyramid. The standardization is a result of optimization. All tents (four person tents included) are now so well-made that it’s difficult to improve upon them. In the years to come we will see small tweaks and some interesting experiments, but if you’re waiting on the next major breakthrough in tent technology it’s going to be awhile. With how many great four person tents are on the market right now we think now is the time to find one that suits your style!